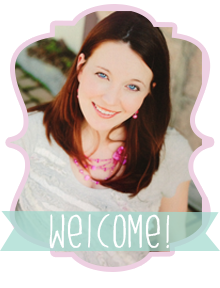 Crazy May Days: Books with Belle! I really don't think there was any way to truly prepare for our library adventures today. Looking back, I wish I could have seen a little preview because everyone could use a little laugh in the morning...especially one without coffee! When I informed Molly that Princess Belle was making an appearance at story time, a squeal rang out and a bolt of curly frizz tore down the hall. When I rounded the corner to her room I found her elbow deep in her dress-up box. Apparently, there is a standard wardrobe for meetings with royalty and jewelry is a MUST. When we arrived at the library, Molly informed me that she saw "Princess Belle's car". Who knew that Princess Belle drove a black Lexus SUV? Princess Belle, I like your style. Getting out of the car I had a little panic moment when I realized that Gabe's stroller was left at home. He was going to be EVERYWHERE...or so I thought. There is really is no way to capture the next series of events. This is my meek attempt to convey the experience so bare with me. I need you to visualize about 45 girls under the age of 5 all decked out in tiaras, jewelry, make-up, costumes and boas. Apparently, they had received the memo about appropriate-princess-meeting-attire as well. It was madness. Gabriel took one look at this girl driven chaos and quickly became an accessory to my wardrobe... like a nice clingy sweater? At least I didn't have to chase him too. But Molly... well, she was in her own little heaven. 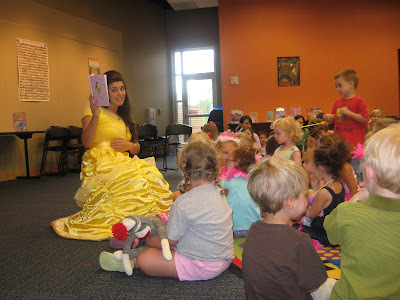 You know, Belle really did a great job at story time. I have to admit that typically it is a pretty restless crowd and she handled it like...well, like royalty. My favorite part of the experience was all the sidebar converations. The girl next to Molly was talking about her princess party featuring Belle, of course. Molly had a lot to add to that conversation. Another girl spent the entire time petting Belle's dress and cooing, "Belle, your dress is so beautiful". 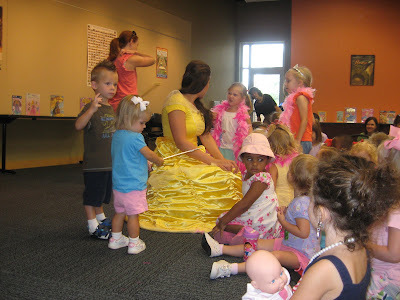 My personal favorite comment was towards the end of story time when a little girl yells out, "Belle! I have a boyfriend too!!!" I couldn't contain my laughter by this point. As soon as story time ended, Molly quickly rushed Belle for a picture. Incredibly, Molly was the first to have a picture with Belle. The minute Belle said Molly's name it left her shell-shocked...I mean, tongue out and all and she just couldn't regain coolness... perhaps she was a bit overwhelmed? After this picture is taken, Belle turns to Molly and says, "Have a good day Princess". Molly's response, "Okay! Because I am a princess too...named Jasmine." Apparently, Belle and Molly are besties in the royal world. Oh, I just don't think the library will ever be quite as much fun as today. THIS is why I love love love LOVE Children's Theatre!! They are just too amazing and the imaginations and suspension of disbelief is just out of control! 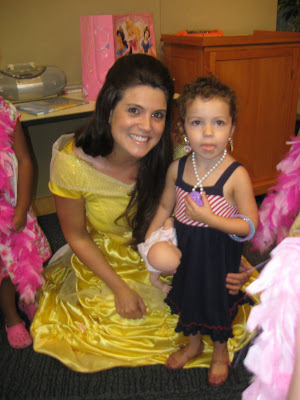 :) I am SO glad that Molly got to meet Princess Belle. Oh, Momo...you are indeed our little princess! Oh my goodness- that is so great! I have no experience with the princess phase (and I am quite okay with that!) so I love reading about princess Molly-Jasmine. Oye... girls!